We have recently been looking to assist a scaffolding company that were looking for invoice finance. This type of finance will release cash from their sales invoices as soon as they raise them, rather than having to wait for the customer (often construction sector businesses) to pay their invoice. We can also help finance the purchase of scaffold equipment and staging, if required. One of the issues that has become apparent is that some invoice finance companies consider scaffolding part of the construction sector (and fund it under their construction finance product), and some consider it a peripheral trade. This makes a huge difference to the level at which they will finance scaffolders. The invoice finance companies that consider it construction sector debt will offer a lower prepayment. They limit the prepayment percentage (as they do for other construction sector businesses) at a maximum of about 70%. However, those that consider scaffolders as peripheral to the construction sector, will fund as high as 75-80% of invoice values. You need to know which approach a particular funder will take. One of the key considerations of invoice financiers when funding scaffolding invoices is whether or not the company owns the scaffolding equipment. This would be the scaffold tubes (poles), scaffold boards and fittings e.g. couplers and ties. If these are not owned by the scaffolder, the invoice financiers worry that any failure of the scaffolder to pay their supplier for the equipment, could result in it being removed from site, leading to disputes over the payment of their invoices, and debts, to the end user. This is of course not a problem if they own the equipment. Ownership of the equipment is not necessarily a prerequisite to receive funding, but non-ownership may result in a lower prepayment percentage, and certain funders may not wish to finance your company at all. We can help you with introductions to funders that can help. 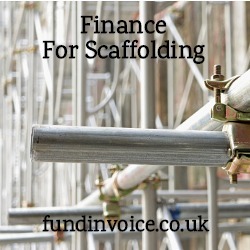 In addition to prepayments against invoices, we can help you find finance to buy scaffolding equipment. The finance could be in the form of a simple business loan (or a loan in addition to an invoice finance facility), or other forms of asset finance that help you spread the cost of purchasing equipment over a long period of time. For help please call Sean on 03330 113622 to discuss invoice finance and/or equipment finance for the scaffolding sector.